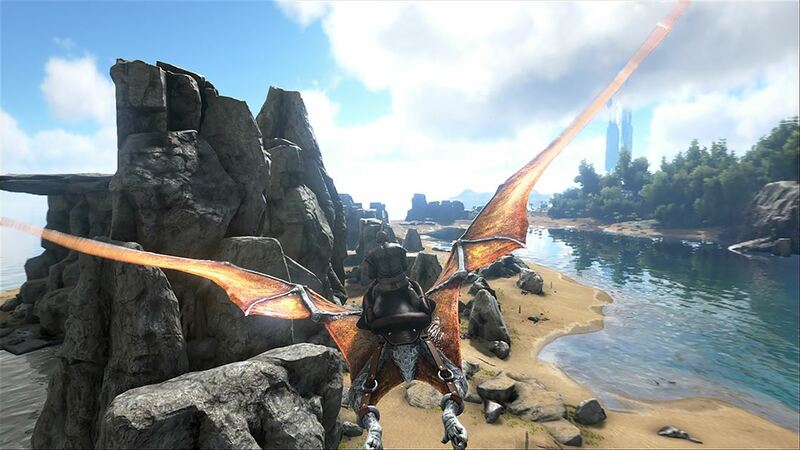 ARK: Survival Evolved was developed by Instinct Games, Studio Wildcard, Efecto Studio, Virtual Basement, and published by Studio Wildcard. 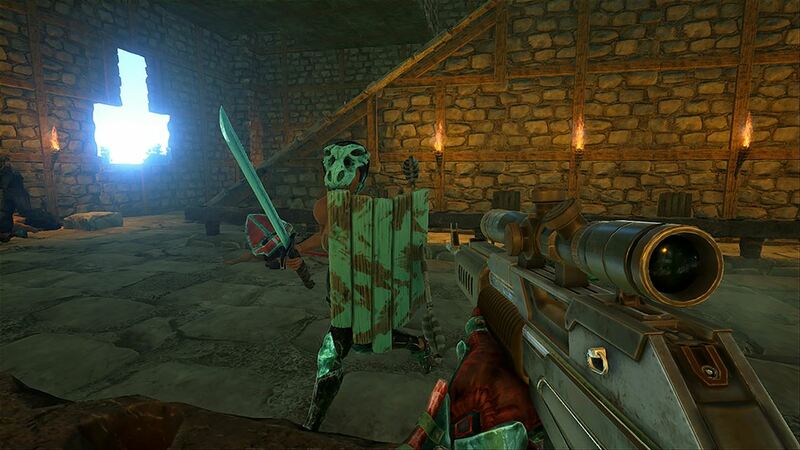 The game was originally released for Steam in June 2015 as an early access. It is available for Xbox One and Playstation 4 and is planned to officially release in summer of 2016. A press review copy was provided for The Hidden Levels. It is currently priced at $34.99 but may increase once it’s released. 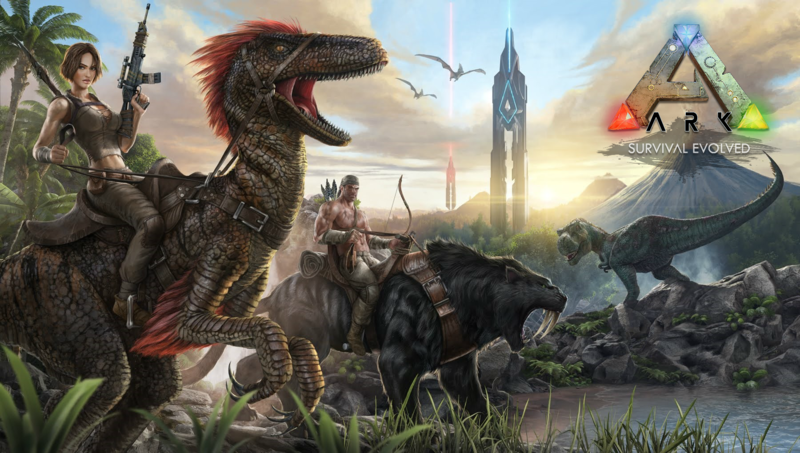 ARK: Survival Evolved is an open world online survival adventure game which can be played as single or multiplayer mode. These modes are PvP in an all-out Player vs Player or within a group of friends in the PvE, Player vs Environment. For those just starting out the PvE mode is the way to go. In this mode you are working together to build your camp without worry about other players invading. Also in this mode you have access to change your environmental and player settings to suit how fast you want to level up during the game. This game is a never ending, always changing world with multiple outcomes depending on how well you evolve and adapt to the harsh environment and the carnivorous animals hunting you. Unfortunately this game is not finished and may never get finished so if you are thinking of buying it bear that in mind. If and when it is officially released the price point may change to almost double the price it is currently available now. Craft, harvest, and tame – Being stranded, naked, starving and alone on a mysterious Island is how you find yourself when you begin the game. You must forage, craft, harvest and build shelters in order to survive the harsh environment. Learning to build weapons allows you to hunt for meat and hide to make clothing and tools. You learn skills to tame and ride dinosaurs using a challenging capture-&-affinity process by weakening the creature and rendering it unconscious and using food to nurture it back to health; gaining its trust and basically moving up the food chain. The game is challenging and that is what makes it worth playing. You evolve and grow the same as any living eco-system. Tribe system – Trying to build up a small civilization on your own would be quite daunting but if you can rally up some friends you can build yourself a pretty sweet fortified camp. This is why the tribe system is so effective when playing ARK, you are much stronger when you work together to co-exist in this living eco-system. Each tribe member can be given a particular job ensuring a faster build and better odds of survival. Material things – Another very cool aspect of this game is whatever you craft or build wears down with time and also can be damaged by invading enemies or rambunctious dinosaurs. Repairs are needed and this is done by collecting the items you needed to previously build or craft that item. This adds a real life feel to daily wear and tear on tools and buildings. Eating all the time – In the beginning when you are first learning it is difficult to stay alive with all the prey, lack of food, and the no clothes situation. It took a long time to finally figure out how to stay hydrated and well fed. This can be very problematic when being chased by larger prey who want to eat you when ultimately you need to eat them to survive. Another unfortunate but realistic addition is once your have gathered enough food to eat you then must find a way to keep it from spoiling, and it spoils fast! By eating whatever you can to survive you quickly discover which berries are best and which ones can do more harm than good. After playing for a bit it was discovered that you can turn down your settings so it takes longer to deplete your hunger which was helpful but for those who want to stick to the default it is still rather difficult. Survival of the fittest – Like most multiplayer games there will always be that guy or that clan with one precedent; kill and conquer other tribes with no mercy. For some this may be a challenge and something that they enjoy. When you build an entire fortified camp which may take many hours of collecting, crafting, and building can be lost in one bloody minute it can be very frustrating. Unless you are the one on the winning side. So I recommend first time players to play the PvE (player vs environment) mode. Stuck at the hip – When starting the game PvE mode is best for learning the game but it quickly becomes apparent that you are not able to explore this open world as freely as you would like. There is a radius that each player must remain within and this hinders your game play for foraging and exploring on your own. I am guessing this was added to the game to keep you working together as a true tribe but it does cause issues when others want to venture off on their own. Even though this can be a hindrance for most players I can work around it as I like to play games with my husband and we can easily agree to stick to a plan when building our stronghold and surviving the ARK. When playing with others it can quickly become disorganized and chaotic as everyone has their own agenda when starting the game. For me many games are new and I am just learning what genre I like and how I play games. 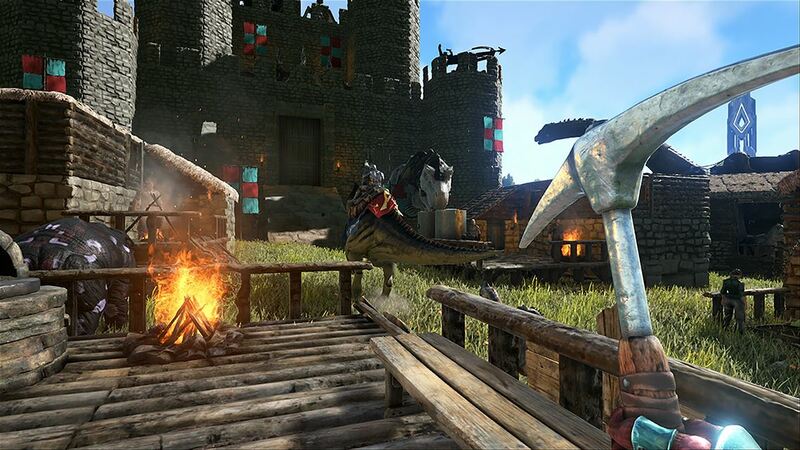 ARK: Survival Evolved is a game that, once figured out, is very enjoyable to play. The challenge of building a stronghold with nothing but your hands, your instinct and sheer determination is a game I can sink my teeth into. Even though this game is not officially finished I am not really concerned as there is so much to do, learn and build to you keep you busy for countless hours. Great review CuteLibrarian!!! Well done!